watch your personalized design ideas come to life! 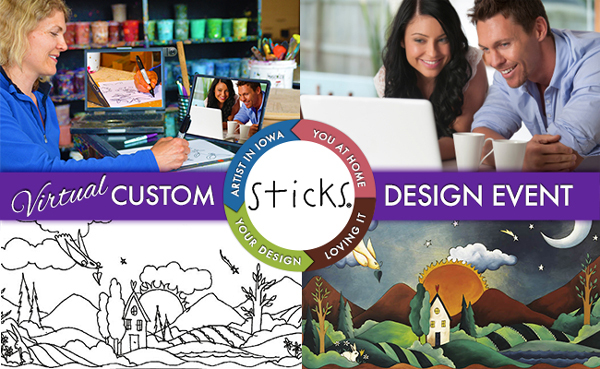 Through the magic of computers, be instantly transported to the Sticks studio in Iowa and work directly with the artist to design the Sticks item of your dreams. See examples from last years event! From the comfort of your; home, office, or anywhere you can get an internet connection. Don’t worry about the technical stuff, we’ve made it simple and will be there to help you get connected. Local: Come meet the Sticks artist in person at the Savage Mill, MD store. Location Address The beauty of this event is that it’s Virtual or In-Person. You can participate from the comfort of your couch, work or local coffee shop or come into our shop and meet the artist! Simply choose your preferred date below and then choose your time from the EventBrite registration page. You will then receive a follow up email or phone confirmation with additional information prior to the day of the event. If you decide to participate via internet connection then we will provide you with simple instruction to get you connected with the Sticks artist in our Savage Mill location through Video Conference. All you need is an internet connection! If you decide to participate at our Savage Mill, MD location then you will have the opportunity to interact with a Sticks artist in person. No need for internets! 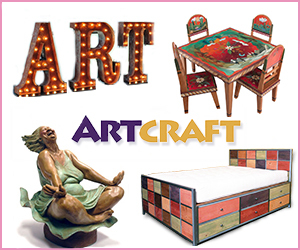 You will communicate with the artist about what type of item you would like to design, be it a; Mirror, Bed, Dining Table, Chest, etc. View the entire Catalog for inspiration. Tell the artist about your favorite colors, special things you would like incorporated into your design and the meaningful words that will make this piece something to cherish for generations to come.Marvel as your personal design unfolds on the screen as your ideas become a working design. A few short weeks later, your amazing, one-of-a-kind Sticks item will arrive at your doorstep for you to enjoy your Sticks creation everyday for years to come! Your Sticks Custom Design appointment with the artist is FREE! The only cost is the actual price of the item you’ll be ordering. Shipping is FREE, yep, free shipping! 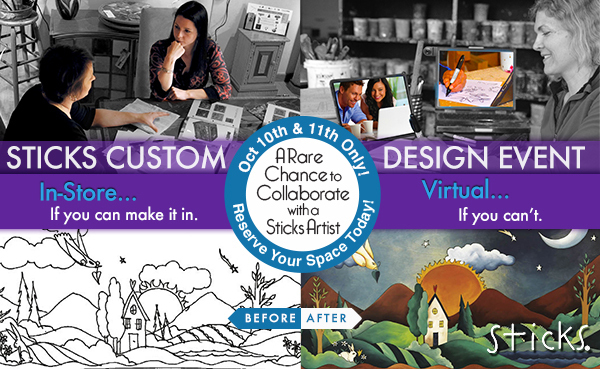 Register today to schedule your one-to-one creative design session. Don’t hesitate, space is limited! -Brenda and Paul, Sticks Design Event 2011.